I’m big on New Year’s Resolutions. For me it’s the perfect time to set goals for the upcoming year. I always make two sets: one for my personal life and one for my business. My Mom used to be a firm believer in writing down your goals and putting them somewhere you could see them every day. She used to cut out pictures and put them on her desk. They might be photos or words representing an idea, or item, that she wanted or wanted to create in her life. Sometimes she cut out pictures and put them on a poster board. I didn’t pay much attention to this, but over time, I realized that a good deal of her pictures and words from her poster board really did pass into our lives. I think sometimes it is as simple as just defining what you want so you can begin consciously and unconsciously taking steps towards that goal. Honeysuckle Hollow started with a New Year’s resolution. Well, this flower journey actually started much earlier. I digress. I was in love with flowers when I was born I think. At least I know I was by the time I can remember. I had a small vase collection at a very young age and spent my time gleefully amidst the gardens of my mother, grandmothers, and aunts. I was always the one insisting on cutting the flowers and bringing them inside to be arranged and enjoyed up close. I wanted to look at them, inspect them, smell them, and do it all again and again as I went about the house. I wanted them all over our house. I can honestly remember how cheery they made a bathroom feel or how I could smell them by my bed in the night. My mother is a master gardener, and we always had gardens at every home we lived in, or my mother would create one. I come from a long line of gardeners, and flowers are in my blood. My mom working in one of her many gardens. I worked at garden nurseries when I was in college and in a small florist in the mountains one winter. I had always wanted to be a florist, but when I actually worked there, I found that it wasn’t as inspiring as I had imagined. We got nearly the same flowers in every week, and they weren’t very beautiful (with a few exceptions). They were just the plain ones you might expect: roses, daisies, carnations, iris, and a tulip or two. I found it hard to be as creative as I was when I made arrangements out of my gardens. And so, I decided that maybe being a florist wasn’t for me. I continued on and graduated with a business degree. I went on to law school because I love the English language. I actually love deciphering meanings out of words and researching (and nerdy things like that). What I hadn’t considered was that I do not love conflict. After 14 years of being a lawyer and representing children who had been abused and neglected and fighting on their behalf, I began to search out creative projects more and more. I spent more time with my horses, in my gardens, cooking up elaborate meals, knitting, reading, and dabbling in watercolor. I needed the process of creating things, of creating beauty…it kept me going. I included my kids in these pursuits, and we had a grand time. A fairy garden my kids and I made. Sometime in 2013 I was reading Victoria Magazine, as I always do since my grandmother and mother have been subscribers for years. There are always feature stories about women entrepreneurs and their creative endeavors. I had an epiphany. I wanted to be one of those ladies. I wanted more creativity in my life. I wanted to have at least a side job that I loved and that was artistic and filled with beauty. In January of 2014 I actually made a secret New Year’s resolution. It was simply “ to do something creative for pay”. I wrote it down and stuck it in my wallet. My goal had been set. I had no idea what I would do…maybe some type of cottage craft that I would sell on Etsy or something. Then we had a long, cold, dreary patch of days as we often do in our Midwest winters. I craved flowers in my house. I went to the grocery store, and I could not find one single flower that looked beautiful in the way I remember my flowers in the garden looking beautiful. Many of them were dyed. I became a bit crazed at finding a flower that made me swoon like they used to. I went online and found some bright, cheery, and very fragrant narcissus (little daffodils) from a West Coast retailer (on a referral from an article I read about seasonal flowers). I thought they were just what I needed to cheer up my kitchen table. Now, normally, I would have just ordered some for myself and that would have been that. But for whatever reason, I decided to fly in extra and call up some friends to see if they would like to buy some for their homes. They did. They were as starved for living beauty at this time of year as I was. I decided I would do it every month. 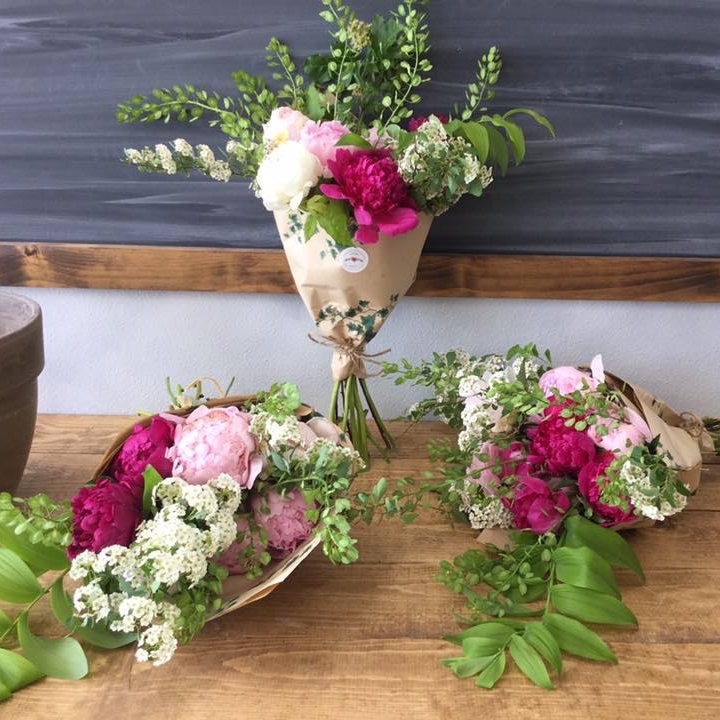 I would find flower growers with special, seasonal flowers and then buy them and set them out on my kitchen table and invite friends to stop in and buy some. Narcissus: The first flower I ordered! I found that I had to get a wholesale license to buy from some farms; so I did. I had to come up with a name, so I called it Honeysuckle Hollow because that was the name of my farm. We had wild honeysuckle growing all over the woods, and I had named our farm that when I moved in. I told my husband that I was going to have this little side business. Yes, it was going to be my little creative endeavor to bring beauty into my life. My resolution came to fruition in less than 60 days from the time I wrote it on a piece of paper. Wild honeysuckle on my farm. I sent out little invitations for my monthly flower sales to friends. They came and brought a few of their friends. It was such fun. Here are a few pictures of the flowers I sold out of my little cabin on our farm. One month I was reading my favorite flower book “Bringing Nature Home: Floral Arrangements Inspired by Nature” by Ngoc Minh Ngo and Nicolette Owen. I noticed a fun flower tutorial in the back about creating an arrangement in a newer, more natural style of arrangement than I had been exposed to. At my next sale, I followed the design tutorial and created a unique arrangement out of the flowers I had brought in that month. I put it out for display at my sale. Everyone asked about it. I didn’t sell it because I said it was just display but I quickly realized that people didn’t know what to do with all the single flowers sitting on my kitchen table. They wanted them arranged, and they were intrigued by this unique, natural style of arrangement. I decided to do more arrangements in the future. I began looking at every article and book I could find about this new “garden style” of arranging. By now, it was Mother’s day of 2014. I ordered in a bunch of flowers, including a LOT of incredible coral peonies. In fact, I had coral peonies in every room in our house it seemed. My husband and kids had to wear sweaters because I had turned down the heat to keep the flowers fresh. They couldn’t even get into their dresser drawers to get out clothes because there were buckets all over! That Mother’s Day, my then-nanny Vanessa, who most of our customers know, and I set out loose flowers as always to make it like a European flower market, but I also made up quite a few arrangements. Lots of people came up my bumpy dirt driveway to buy special my special flowers. Those coral peonies blew them away. Most people had never seen them before. Honestly, those peonies jump-started my business. Word of them carried through town. In reality, it was not me who made waves, it was those incredibly gorgeous, huge flowers that stole the show. I saw how much people desired different flowers. Flowers and arrangements that were wilder, more natural, more romantic, more fragrant, and WAY more inspiring. I have had friends tell me they actually teared up when they brought some of the flowers home. I told them that I have done the same. Sometimes real beauty can well up inside of us. It feeds the soul, they say. So, this is what had come from that one little, simple yet monumental new year’s resolution…a little business that was filling our community with beauty. My journey from there was a roller coaster. I quit for a bit because it all became too overwhelming and I wasn’t sure I should be neglecting my “career” as a lawyer to do this “frivolous” pursuit. I went back to law full time for a while, but I realized that I could not put the genie back in the bottle. I had been part of a business that was based on passion and creativity and beauty. Closing it for those brief months had felt like a loss. I mourned it. I started buying a few flowers for people who called and did a few small events because my phone kept ringing. I attended one of the life-changing Floret Flower Farm design workshops and before I knew it, I had run headlong into the business again. We had a family discussion and decided that I would go back to doing my once a month flower sales and continue with law. I opened a shop in a retail location for Valentine’s Day in 2015. It was thrilling to have made the jump for real this time. There was no turning back. We decorated the shop, ordered in a ton of flowers and that was that. I continued doing flowers part time and practicing law part time. It was wonderful, but far too busy and chaotic. I would practice law in the day, spend the evenings with my family and then run to the shop during the night to arrange flowers. Again, I ran into a wall. This was not working either. I had to make a choice. One or the other. After many hours of serious discussion and thought and tears, I chose flowers. I took a huge leap and crossed into a new chapter of life. I have to extend a HUGE thank you to my supportive, generous husband who is the reason I was able to do this. I jumped into a new business totally unlike what I had been doing for the past 14 years. It was terrifying, and yet it felt right. It felt like what I had always been meant to do. Really, it did. It was as if I was truly myself for the first time in ages. Who knows what the future will bring, so I of course maintain my law license as I am a lawyer and always have that to fall back on. Education is great that way. It is never a waste but instead a building block and no one can ever take it away. The interesting thing is that I don’t miss law. I don’t miss all the conflict, and I don’t even feel like a lawyer anymore. I feel like a floral designer. After doing flowers exclusively for a year and a half, it has become my new career. Aren’t we entitled to have more than one career in a lifetime? I’m inclined to say yes. Honeysuckle Hollow now is primarily an event florist (meaning we specialize in all types of events from weddings to corporate parties to private dinner parties and everything in between) but we also open up for one retail day to the public every month. 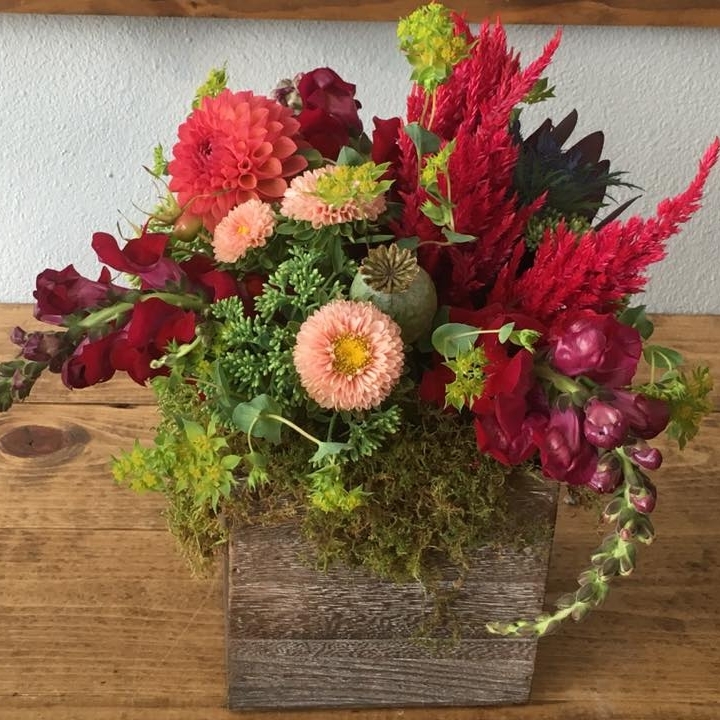 These open houses are a wonderful way to showcase and sell our unique flowers and nature-inspired floral designs to the public. We bring something different in every month to keep flowers exciting. Bringing beauty to our community is a wonderful pursuit, and I have met so many new people that I can hardly believe it! I have lived here for the past 20 years, but it has been flowers that have truly connected me with this community. My kids help out at the shop and on my adventures foraging flowers and greenery, and sometimes in the garden too. My husband has to help out with the kids a lot more during evenings and weekends when I am at the shop due to events, but we have adjusted to that as well. It has been a wild few years but I wouldn’t trade this adventure for anything! And with all of that said, it is January again and time to set new resolutions. Resolutions. That was where this blog started, wasn’t it? Look what happened with one simple resolution. Incredible. With the power of resolutions in mind, I just finished a major goal setting/resolution-making meeting with Summer. We set down some very grand and some itty bitty resolutions for our shop this year. We are typing them up now and will pin them on the wall in our design room at the shop so we have to see them often. We are now working on the action steps to help us get to these goals. Frankly, it’s a bit daunting and scary. I look at these resolutions and wonder how they can ever come true, but that little twinkle of hope sparkles out there. Reminding myself today of what we have done already helps me believe that Honeysuckle Hollow can become all that we hope. I am thankful that my Mom still prods us each year to write down our resolutions and that she has always given us the courage to believe they can be accomplished. I am also inspired by my husband, who sets the loftiest and grandest goals of anyone I know and achieves them! He has an incredibly huge one he just put out there into the world this year, and I laughed. Then I thought better of that. It’s possible after all, and so I remind him of it often and continue to throw it out to the universe. Who knows, maybe one day I will look back and remember that this was the year we imagined it. As for you, do you set resolutions each year? Have any of them changed your life? I’d love to know!